In 1914, America unveiled its greatest engineering marvel, the Panama Canal. In its first year the canal saw more than 1,000 ships pass through its gates. Today, more than 815,000 vessels cross the passage making it one of the seven wonders of the modern world. Years before completing the canal, the U.S. decided to start raising money for the Panama–Pacific International Exposition, a celebration to commemorate the project. Funding, however, slowed after the upheaval of the San Francisco earthquake. Unexpectedly, this delay allowed more time for fundraising efforts. The expo became a celebration not only of the canal, but also of San Francisco's recovery from the natural disaster. The San Francisco mint would become the birthplace of the Panama–Pacific commemorative coin. These coins were round and octagonal $50 pieces that would become the highest denomination, and largest gold pieces struck in the U.S at that time. Previously, the U.S. Government did not allow the Mint to sell commemorative coins to the public. Instead, they allowed a group, or an organization to purchase such coins at face value. The purchasing organization could then sell the pieces directly to the public in a fundraising capacity. Former president of the American Numismatic Association, Frank Zerbe, was chosen to undertake this effort. The obverse side of the coin depicts Liberty scattering flower and fruits from a cornucopia. This bountiful representation is meant to signify the rich trade opportunities expected from the construction of the canal merging two, previously distant parts of the world. The mint mark, an “S”, tells the owner that the piece was minted in San Francisco. The coins were possible due, in part, to California Congressman Julius Kahn who introduced two bills calling for the commemorative coins. The bill made provisions for four designs, two $50 pieces with different shapes (one round, the other octagonal), a commemorative medal for sale to those attending the expo, and finally, a piece designed to be an award medal for those with prize-winning exhibitions. Several sculptures were considered for the design work. Eventually, the artist's designs were approved, and they sent bronze casts of their work to Medallic Art Company. These initial pieces would allow the mint to fabricate dies for casting. The coins were so large that the equipment at the San Francisco mint was insufficient. To solve this problem, officials at the Philadelphia mint shipped larger hydraulic metal presses to assist in the production. Surprisingly, the coins did not sell well. In time, many were returned to the mint for melting. Today, the Panama-Pacific half dollar can fetch anywhere from $375 to $2,500 based on the condition. The most valuable pieces, however, are the round and octagonal $50 coins. In top condition the $50 round piece could earn up to $240,000 according to experts. 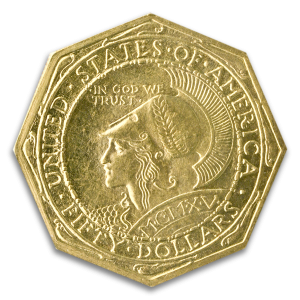 In mint condition the $50 octagonal coin could command up to $245,000. Though relatively rare, the Panama–Pacific commemorative coins are as enduring as the Panama Canal.